My fascination with built environments comes in part form growing up the child of an architect interested in modernism and an industrial designer interested in computers and public transport. I’ve always loved city building games, and about a month after I moved, Paradox Interactive’s Cities: Skylines got an expansion called ‘Snowfall’ that added trams. I love trams — they’re one of the major reasons I moved to Melbourne. I had to have it. Playing in anticipation of the expansion’s release, I pulled up a save game from before I’d moved. I noticed a couple of things. Firstly, I never used any road type larger than three-lane highway, and preferred two lanes in either direction. I scoffed at the six-lane carriageway — who could ever need that many lanes? I built cities in which space was at a premium, and highways were on the periphery, never leading into the center. I raged at the traffic jams and refused to destroy what I thought of as valuable inner-city real estate just to build more expressways. I always built on the river or coast, despite the ways this caused restrictions on traffic into or out of my city centers. These were the assumptions of someone who’d lived his entire life in Sydney, a city whose Central Business District still follows the late 18th century layout of the Marines’ tents from 1790. And the game refused to operate according to my preconceptions — being made by Swedes, beachside real estate in Skylines isn’t worth any more than any other patch of land. The city I’m currently building has a wide-open grid with four-lane rods spaced evenly throughout. I’m using options I’d never thought necessary before. It has ring roads of six lanes each. It’s set back from the coast so I can expand north, south, east and west. There are two concentric ring-roads, each connected directly to the heart of the city by expressways. 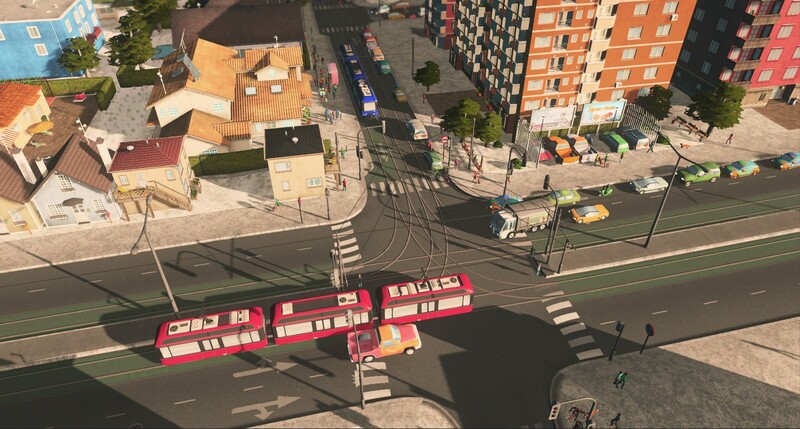 And of course, it makes heavy use of a dense network of trams. The city works a lot better because I’m not fighting to use each and every square meter, and because I’ve left space from day one for train corridors and new highways. I’m currently in Sydney on a brief trip home. When I got off the train at central station I was struck by how small everything felt. This was the exact reverse of my shock that a city smaller than Sydney could need not one but two terminus stations — Flinders Street and Southern Cross — each larger than Central. Now, to my eyes, Central was a badly-designed mess, packed into too little space. This feeling continued once I got to Mum and Dad’s, where I’m staying. “How could Warringah Road have only three lanes?” I thought. “Don’t they know it’s a main arterial road?” Parking on the tiny streets of the Inner West — a health hazard for wing mirrors, as I’ve found out twice in the last six months — feels like urban cholesterol. In Melbourne, it feels like clockwork. These are of course the rose-tinted specs of the recent convert. 34 years of familiarity breeds a lot of contempt for my hometown. But it has made me think about the other assumptions contained int he city-building games of my youth. The original SimCity was a modernist’s dream. It enforced the 1811 Commissioner’s Plan of Manhattan on your cities with its straight roads, 90 degree corners, 3x3 zoning blocks and top-down grid. 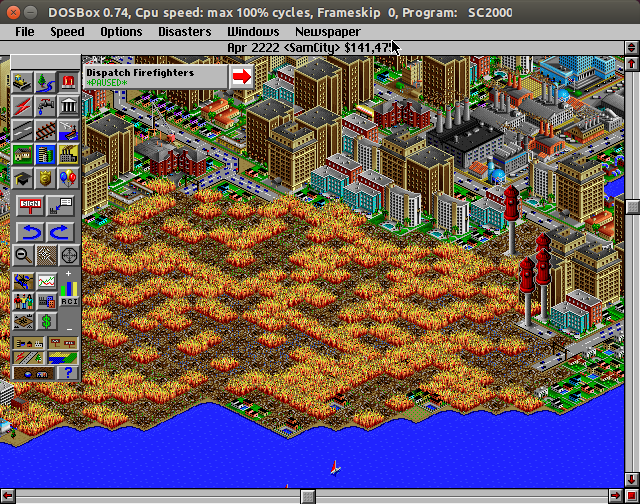 Even SimCity 2000 and 3000 only allowed diagonals rather than curves. Even as a teenager, my sense that my expectations and experiences of city life in Sydney didn’t fit the game was brought home to me by watching my dad play the game. “Why aren’t you filling in that space there?” I asked him. “It’s a national park,” he replied. I couldn't figure out how to explain to him that the game didn’t care about the trees in that space, didn’t provide any reason at all in its mechanics to leave land undeveloped. How could this make sense to him when just down the road from our house was a large expanse of native bushland with only a single four-lane road connecting the suburbs on either side of it? Cities XL, despite its dystopian vision of a city with no public transport, at least offered curved roads. Suddenly it became possible to add the willful snake of Broadway to your replica of early 19th-century New York, or build a hub-and-spokes, car-centric city like LA or Chicago (post 1871, or course). As long as you didn’t want trains or trams. 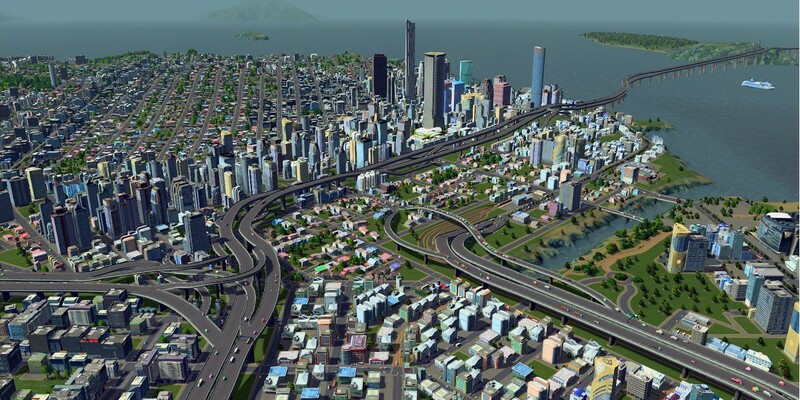 But Cities: Skylines offers something else interesting — a European take on city design. Only a few cities in Europe have had the benefit of a 20th century tabula rasa enabling the adoption of a grid — Barcelona being one notable example. So unlike the Maxis games from the 90s and 2000s, Skylines doesn’t enforce American assumptions about the movement of people or the layout of a city. In fact, the recent expansions make a bunch of European assumptions — the ideal of district heating is included in the design of your city’s water system, rather than individual houses managing their own heating needs, like the neoliberal American model. The governance policies assume state healthcare and schooling. Unlike Australian cities, which have one massive commerical district at their heart — and increasingly satellite CBDs radiating out from the city in the hub-and-spokes model — there’s nothing in the code of the game that requires you to concentrate all your high-density commercial. In fact it can be easier to spread it out, preventing traffic jams and long commutes. But there’s one thing no city-builder that I’ve played has yet managed, and that’s change over time, or a sense of history. As I mentioned above, Sydney’s claustrophobic and pokey street plan was laid out by a succesison of accidents in the late 18th Century. The marines pitched their tents in a particular spot, so that’s where King Street, Sussex Street, Barrack Street and Clarence Street still lie. The streets of Parramatta were laid out in what was then an immensely forward-looking grid, but because Governor Phillip wanted them wide enough to turn around a bullock train. The wide avenues of Rose Hill were 200 foot wide for this reason. Funny to think that Phillip beat the Commissioners of New York to the grid by thirty years. Cities like Sydney, or Boston, with their colonial origins, or Paris, or London, with their ancient and medieval origins, only make sense if you read them historically. Streets that aren’t straight exist today because at some point in the past different things moved through urban spaces for different reasons — people on foot or horses rather than cars and buses. A street wide enough to turn a bullock train around in makes no sense now, but it can be repurposed for wide pavements for night-time dining and drinking (well, at least before lockout laws). This would be a game in which disasters — a mainstay of the SimCity series — make sense. The fire of Chicago, immortalised in the song about Mrs. O’Leary’s arsonist cow, bequeathed the city its current layout, so logical to modern minds. Fire — the great leveller. Where are the games that represent these changing urban needs? The games where the rage-inducing roads and frustrating rail lines of my home town will make sense to me because I’ll have built them that way myself, for half-remembered reasons that made sense at the time? That’s the city-builder I look forward to. By then I’ll probably hate Melbourne too.